Planning consent has been granted to PLP (Peel Logistics Property) for an 850,000 sq. ft. logistics park in Sheffield. The plans announce a redevelopment of Outokumpo’s former steel works site located immediately adjacent to Junction 34 off the M1. Sheffield City Council have granted PLP detailed planning consent for phase one of the project, comprising of 179,000 sq. ft of development and outline permission for another 660,000 sq. ft development on phase two. Phase one will commence on site later this year and will consist of two units of 45,000 sq. ft and 134,000 sq. ft. Phase two is able to accommodate bespoke requirements of up to 660,000 sq. ft. on 34.5 acres. 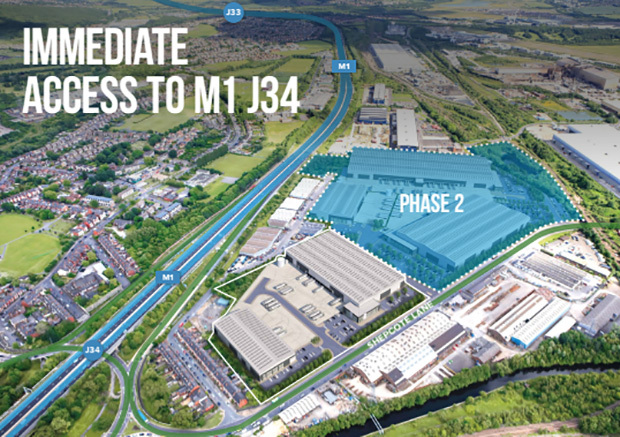 The project’s location in the South Yorkshire region immediately off the M1 at J34 is in an ideal location to offer B2 – B8 occupiers high quality industrial and warehouse space. The entire 50-acre brownfield site will bring employment opportunities to hundreds of people. The site’s unusual location close to the M1, Sheffield City Centre and Meadowhall Shopping Centre, means the development is likely to attract both urban and national operators. Knight Frank, CBRE and Moriarty & co are appointed to market the highly prominent scheme and promising development. Peel Logistics Park is close to Meadowhall Shopping Centre, Meadowhall Retail Park, Valley Entertainment and the new Sheffield IKEA store. It has immediate access to J34 of the M1 motorway, six airports within a 90-mile drive with 75 per cent of the UK within a 4.5-hour HGV drive.